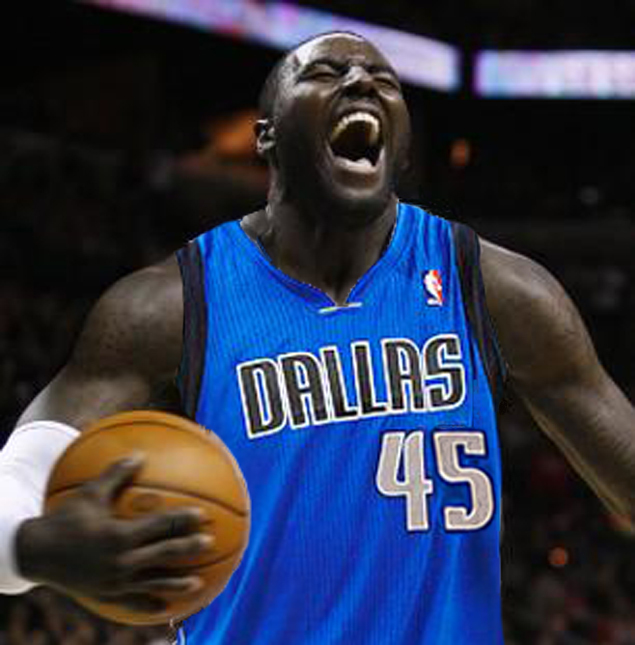 He may have no knees, but he has better knees than another big man the Mavs were pursuing. The Dallas Mavericks have come to terms on a one-year deal worth $1.4 million (the veteran’s minimum) with DeJuan Blair, according to Marc Stein of ESPN. Dallas!!!!! Now lets have some fun!!!! The 6-7, 270 lb. power forward/center was drafted No. 37 out of Pittsburgh by the San Antonio Spurs in 2009 and fell that low due to the fact that he has no ACLs in both of his knees. Even though this seems like it would be a cause of concern, he has had a fairly healthy career during his four years with the Spurs, missing only three games during his first three seasons. Blair has career averages of 7.8 ppg and 5.8 rpg on 52.8 percent shooting from the field. He also has averaged only 18.9 mpg during his four seasons, showing his ability to make an impact with minimal minutes. The 24-year-old bruiser’s per 36-minute stats last season were 13.9 points and 9.7 rebounds on 52.4 percent shooting, according to Basketball Reference. He is known for his scrappy play, rebounding and ability to just find a way to get the ball in the basket. Last season, 81.1 percent of Blair’s shots came in the restricted area or painted non-RA for the Spurs and shot 57.3 percent in these areas. What this means is that Blair does most of his damage in the paint off put-backs or broken plays. The major downside to Blair’s play is his defense. He may work his tail off on every play, but that’s often not enough when it comes to playing against seven footers in the NBA. Being about as tall as most small forwards, Blair struggles to hold his own against much taller opponents who can shoot over the top of him. Since Brandan Wright (6-9) is also undersized for his position, head coach Rick Carlisle will need to make sure his rotations have enough size on the floor or things could get ugly on defense. Just take last year’s NBA Playoffs. Due to Tiago Splitter‘s emergence as the starting center, Blair eventually fell almost completely out of Gregg Popovich‘s rotation. That’s why his minutes dropped from 21.3 two seasons ago to 14.0 last season. After only playing trash time in the first two games against the Los Angeles Lakers in the first round, Blair got 14 and 19 minutes in Game 3 and 4, scoring 13 points in both games on 12-of-15 shooting. He also added 12 total boards. With this signing, it seems that the Mavs have taken themselves out of the Greg Oden race or Oden told them that they were out of the race, so they moved on to Blair. Even if there are those out there that say the Mavs are still in the race, I don’t see Dallas as Oden’s likely destination. It will probably be the New Orleans Pelicans or Miami Heat—teams that can offer him money with no pressure or the chance to win now. Unlike Oden, who hasn’t played an NBA game since 2009, Blair hasn’t missed a substantial amount of games yet. Oden’s ceiling may be higher than Blair’s, but Blair has a higher floor. With a higher floor, Blair gives the Mavs a proven rebounder and competitor. For a team whose leading rebounder was their small forward (Shawn Marion) last season, rebounding was clearly an issue. Dallas had a rebounds per game differential of -3.7, which was third worst in the NBA. By bringing in Samuel Dalembert and Blair, the team should be more respectable on the boards. Dallas management clearly missed out on all their “big fish” targets these past two seasons; however, they do deserve credit for their ability to fill out the roster while maneuvering around the cap line and put together pieces that make the Mavericks a potential playoff team. Mark Cuban and Donnie Nelson should be criticized for the “plan powder dry” approach but praised for finding economically-savvy answers to their roster problems. (The only exception this offseason is Jose Calderon, who was given too long of a contract.) On paper, they have their answers: pass-first point guard (Calderon), No. 2 scorer (Monta Ellis) and low-post defensive presence (Dalembert). And they didn’t go over the cap to fill these needs. Now it’s just time to see these pieces fit together and give Dirk another shot at a postseason run.